Additional dates have been added in Vancouver and Montreal followed closely by a third date in the New York area, scheduled for Giants Stadium on August 5th. Tickets for that event will go on sale on Monday, February 26th. In addition, tour promoters The Next Adventure confirmed today that The Police will perform June 13th at McAfee Coliseum in Oakland (tickets on sale Sunday, Feb. 25th) as well as June 23rd at Dodger Stadium in Los Angeles (tickets on sale Monday, February 26th). 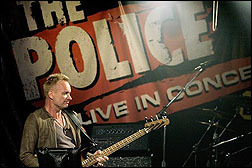 Special guest Fiction Plane, featuring Sting's son Joe Sumner, will join The Police for the North American portion of the tour. Known for their high-energy live shows, this dynamic rock trio will be releasing their 2nd album in May. Fiction Plane are: Sumner (Bass); Seton Daunt (Guitar); Pete Wilhoit (Drums).